On Sunday, October 7, the TTC will improve service on many routes. This is a continuation of the upgrades across the system made possible by Council’s allowing the TTC to spend unexpectedly high fare revenue on more service. This round of improvements begs an intriguing question. These are improvements not driven by some Miller era ideology about improving transit service in the hope that more people will ride, but by the fact that ridership growth has pushed demand on many routes beyond the reduced service standards enacted by the Ford/Stintz administration. A fundamental issue about cities with robust transit demand is that eventually you have to run more service. We may make nips and tucks around the edges, but those pesky passengers just keep showing up at stops. Will Council recognize this fact in the 2013 budget and allow the transit subsidy to grow, or will they cave in to the Ford ideology that no increase is the only acceptable policy? Looking at the projected changes in average loads for many routes, it won’t take much more riding to bring them above the threshold for another service improvement. This is not a one-time effect, and the TTC needs to produce a plan showing how it will deal with the growing demand on all of its network. With the October schedules, the services on Queen will be back on their normal route except for the 502 Downtowner which will be extended from McCaul to Bathurst until mid-November pending completion of water main and track construction on McCaul. 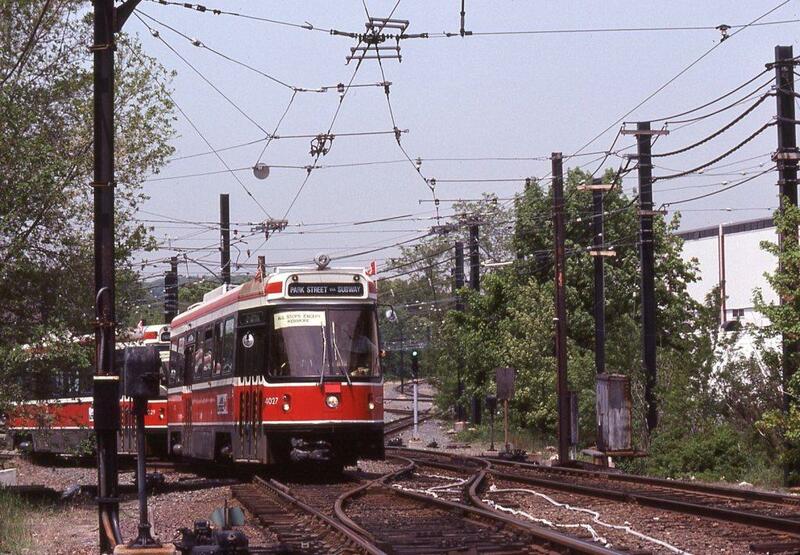 The Spadina streetcar returns between Bloor and King in November, and to Queen’s Quay just before Christmas. September 2012 will bring the restoration of “winter” service levels on routes across the system as well as many service improvements. Most of these occur in the off-peak period thanks to constraints on the size of the fleet and of the operator workforce. The bus fleet is constrained in the peak period by the many construction projects now underway. These require either bus/streetcar substitutions, or additional vehicles on bus routes to deal with congestion. Some of these will end as the fall progresses. A fare policy experiment will begin on the 38 Highland Creek bus on September 1 and will run through until April 27, 2013. Riders with GO fare media will be allowed to ride free between Rouge Hill GO Station and University of Toronto Scarborough Campus. The Yonge-University-Spadina subway will see improved midday service, and the transition between the AM peak and midday will be smoothed. Running times on the Scarborough RT will be extended and headways will be widened. This change is intended “to better reflect actual operation”. How it will affect the SRT’s ability to actually operate all of its scheduled service (the target now is to operate at least 80% of planned trips) is a matter for conjecture. Service on 511 Bathurst will be cut from the summer levels, but will remain above the normal winter schedules to compensate for the construction on Queen’s Quay and on Spadina. Service on the 509 Harbourfront bus will be cut slightly from summer levels. However, all 509 buses will now operate to Exhibition and this will recover the time now wasted by many of them laying over in Spadina Loop. Service west of Spadina will be greatly improved. The 6 Bay bus will be restructured to provide somewhat improved service to the eastern waterfront and the new George Brown College campus. In August, the Dundas branch of the route was extended south to Queen’s Quay. Beginning in September, a new 6C Union to Queen’s Quay service will be added. Dufferin street trackage will be rebuilt north from Dufferin Loop to Queen (skipping over the intersection at King) beginning in September. The 29D Princes Gates service will divert to operate southbound via the “old” Dufferin routing of Peel and Gladstone to Queen, then east to Shaw, south to King, west to Mowat, south to Liberty, east to Fraser and north to King. The northbound buses will follow the route via Shaw and Gladstone back to the regular route. The temporary service arrangements for the routes operating on Queen Street will remain in effect with streetcars diverting between Broadview and Coxwell via Gerrard. Recent press coverage of the opening salvos in Toronto’s 2013 budget process tell us that the Budget Chief, Mike Del Grande, is trying for another year in which he, the Mayor and the City Manager dictate a zero percent increase in city funding to all agencies. This is not playing well with some members of Council according to The Star, and with some luck this will extend to boards of agencies like the TTC. The dynamics of Council have changed since the 2012 budget launch a year ago when the Mayor and City Manager issued a zero-percent edict and drove through cuts to many city services while claiming a massive, if fictional, deficit threatened the city’s integrity. Trying for a repeat performance may play well as part of the already-in-progress 2014 election campaign, but such an attempt runs counter to the will of many on Council. This is a delicate time for management at the City and its agencies like the TTC, and the leadership for a different world view must come from Council and the agency Boards. This will not be as easy as holding a press conference to announce a $30-billion plan for a fairytale network of rapid transit lines that would be paid for through as-yet unknown future taxes and contributions from other governments. This is the real world where the City and its agencies must raise real money from existing revenue streams today, must make decisions that will affect real service levels today, must be prepared to fight for policies that will deliver results today, not decades in the future. The Operating Budget covers the day-to-day cost of running and maintaining the transit system. Major repairs, new vehicles and infrastructure come out of the Capital Budget (about which more later). Generally speaking, expenses and funding cannot be moved between the two budgets. The projected figures are always different from the budget for various reasons. The most common is that expenses never work out exactly as expected due to actual conditions including unexpected changes in major cost centres such as fuel and vehicle repairs. Some details are in the CEO’s report (see compendium of links at the end of the article). Revenue is affected by ridership, but can also be hurt or helped by fluctuations in advertising and rent revenues. While these are small numbers in the larger budget scheme, all of the political debates about transit funding revolve around such small amounts and discuss service cuts or adds in millions of dollars. A bad year for ad revenue coupled with a Council unwilling to backstop the loss with subsidies translates to worse service for riders. The 2012 budgets were amended twice. In June 2012, Council approved increasing the regular expense budget by $2.1m to provide additional service beginning this fall with funding to come from increased revenues. Earlier, when the Commission was still dominated by Ford-friendly appointees, an attempt by Council to fund $5m in added service was thwarted by the Commission who diverted the funding to Wheel-Trans. NOW magazine’s Ben Spurr reports that the TTC will award a contract to Nova Bus for 153 articulated buses. The award is already shown on the TTC’s website with a date of August 2, and this will be confirmed by the Commission at its meeting on September 27. Plans to buy artics have been in the works for a while at TTC, but this is a particularly large order, roughly the equivalent of two years’ of past bus purchases. NOW lists many routes where these might run (the topic has been discussed in past reports to the Commission), and there are no surprises. The critical point in any rollout will be the degree to which service capacity is actually increased. For decades, riders on Bathurst and Queen streetcars have put up with wider headways (which are compounded by delays and short-turns) from the use of articulated streetcars. The TTC bases service levels on the alleged demand and capacity of the route. Demand that gives up and walks, cycles or drives isn’t counted. Vehicles that never show up because of short turns, or which appear in a parade and run little-used, are of no benefit to riders but count toward the scheduled capacity. TTC service standards were changed thanks to the Ford administration’s penny-pinching to stuff more people on routes that provide frequent service, and there is no sign this decision will be reversed. With luck, by the time the new buses arrive, a more enlightened transit funding policy will be in place at Council, but until then, riders on major routes shouldn’t count on any improvement. Back in 1980, the Urban Transportation Development Corporation (UTDC) had suffered the demise of their planned magnetic levitation train system in Toronto, and the “Intermediate Capacity Transit System” (ICTS) we know as the Scarborough RT had not yet been foisted on Toronto. During a brief period when the only viable UTDC product was its new light rail vehicle, the CLRV, they shopped the design around to various systems. The only taker they ever got was San Jose, California, for a small order. 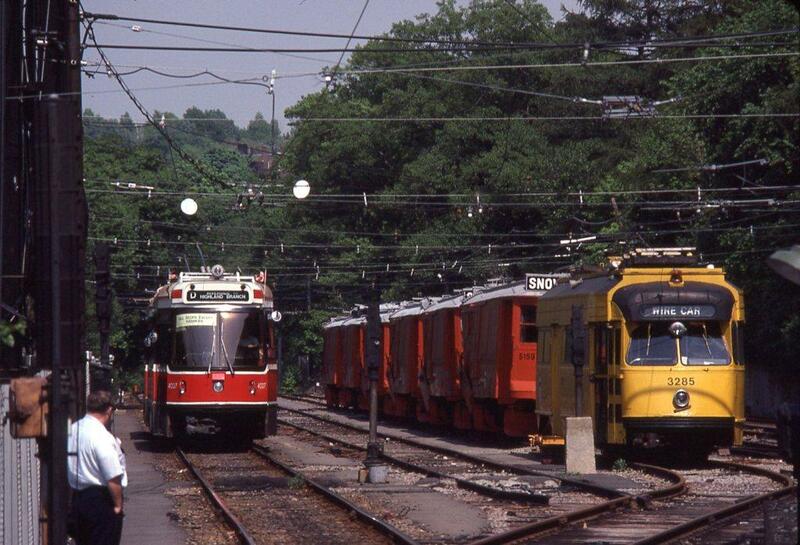 Three CLRVs found their way to Boston for a demonstration, and I was lucky enough to catch them out on the Riverside line in May 1980. A train of 4027 and 4029 prepares to leave Riverside Yard (the outer terminal of the line which includes a large parking lot and the carhouse/shops for the route. A train led by Boeing car 3400 sits beside the CLRVs. 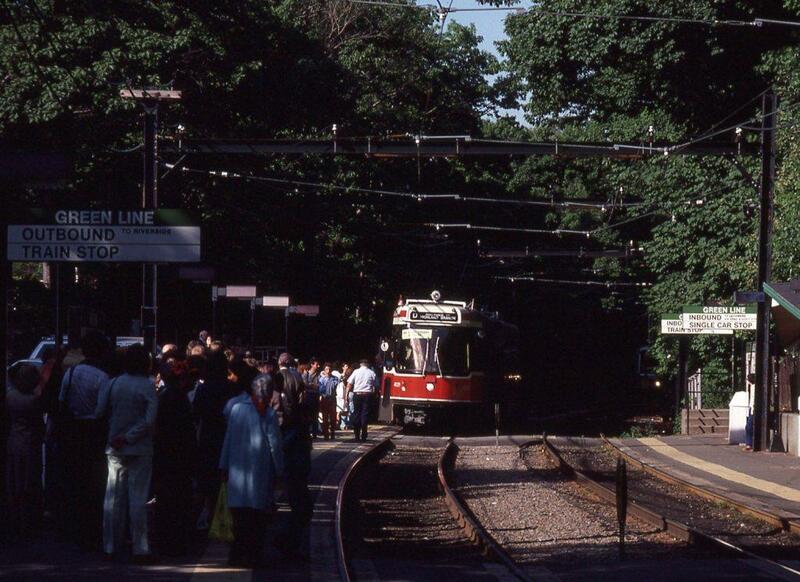 The overhead in Boston at this point was set up for operation by cars with either trolley poles (the remaining PCC fleet) or pantographs (the Boeing cars). The CLRV train pulls out of the yard. 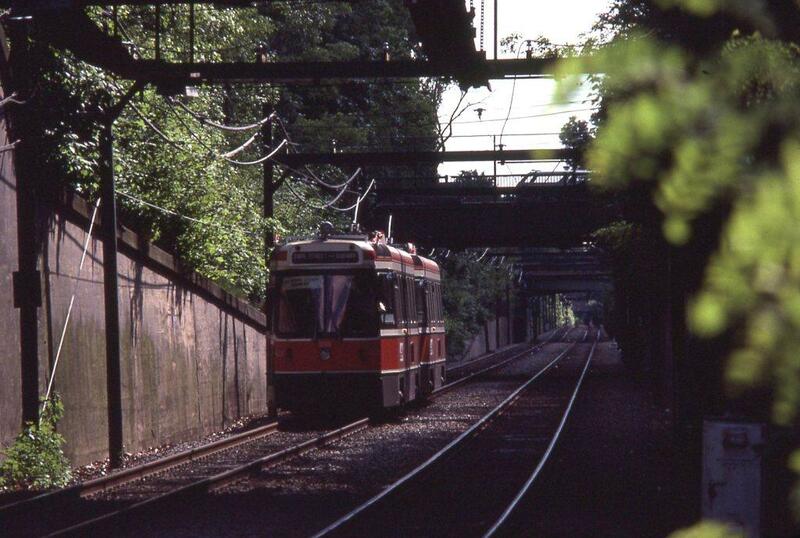 … and onto the main line. 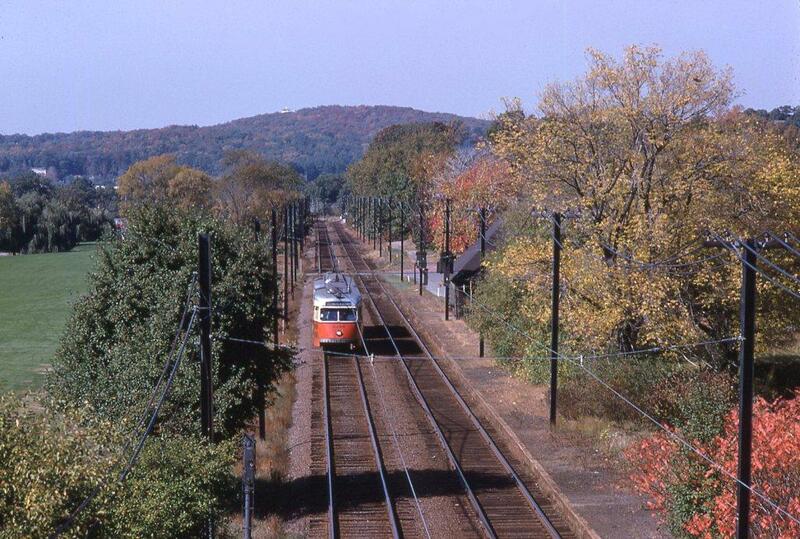 The Riverside Line was build on an abandoned railway corridor, the Highland Branch, and opened in 1959. A new connection into the existing central subway (a streetcar subway dating from 1897) was built to bring cars through downtown. Here the CLRVs pass outbound through Reservoir Yard. 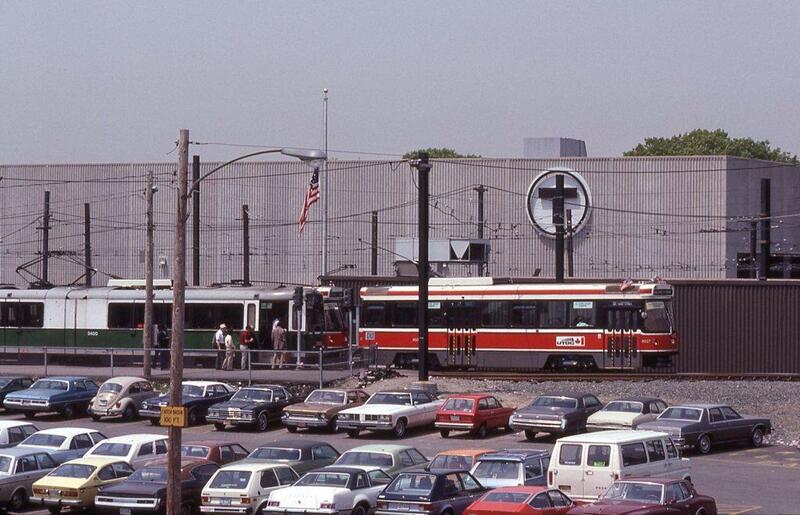 The larger part of this yard and an old carhouse are out of shot to the left, and they serve the Cleveland Circle line which terminates there. Work cars in the yard include a PCC converted for use as a line car, and several “Type 3” passenger cars adapted as snow plows, essential equipment for a network with so much private right-of-way. Outbound at Newton Centre station. 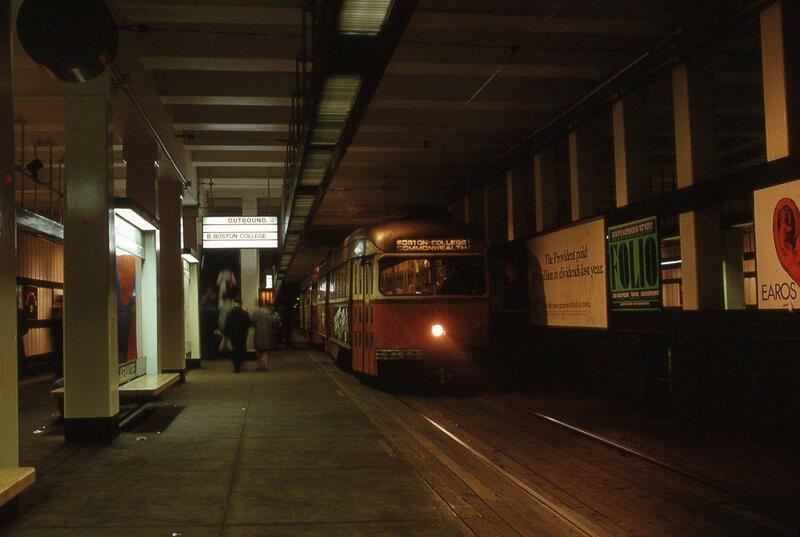 The shot below is from May 1972 at Kenmore Station which opened in 1932. Readers with eagle eyes and long memories will recognize this shot which I loaned to the UTDC for inclusion in a brochure advocating the wonders of LRT which, at the time, the Ontario Government was actually pushing as a product, if not as a “solution” for Toronto. It didn’t last long, and they went back to their old lies about how there was nothing to fill the gap, the missing link, between buses and subways — hence the need for an “intermediate” capacity system. Kenmore Station is a busy place and has separate platforms for routes which diverge here. 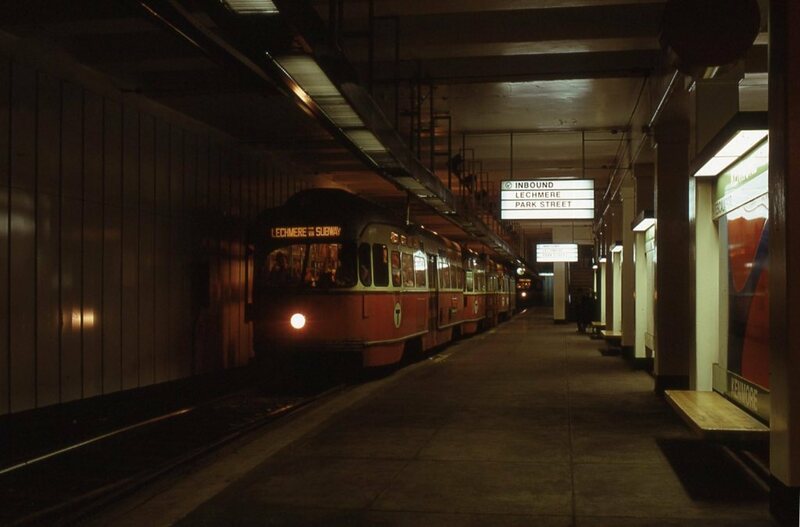 Boston cars have doors on both sides so that they can serve island platforms like this. Needless to say, the CLRVs served only stations with right-side platforms. (The sign in the front window says “All stops except Kenmore” because the Riverside trains used the outside tracks at this station.) Yes, that’s a three-car train of PCCs sitting at the platform. 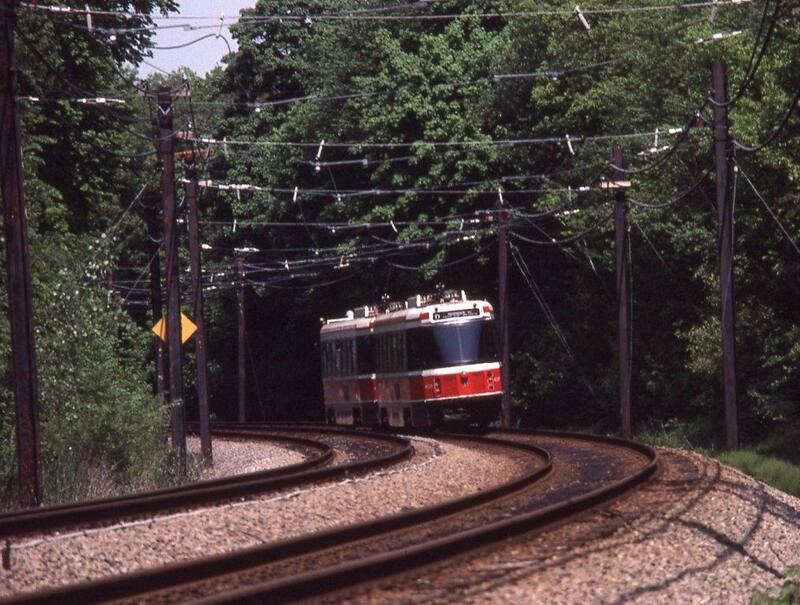 By the time the SRT and its expensive ICTS opened at a cost more than double the original estimate for LRT, the Riverside line had been operating for 25 years. 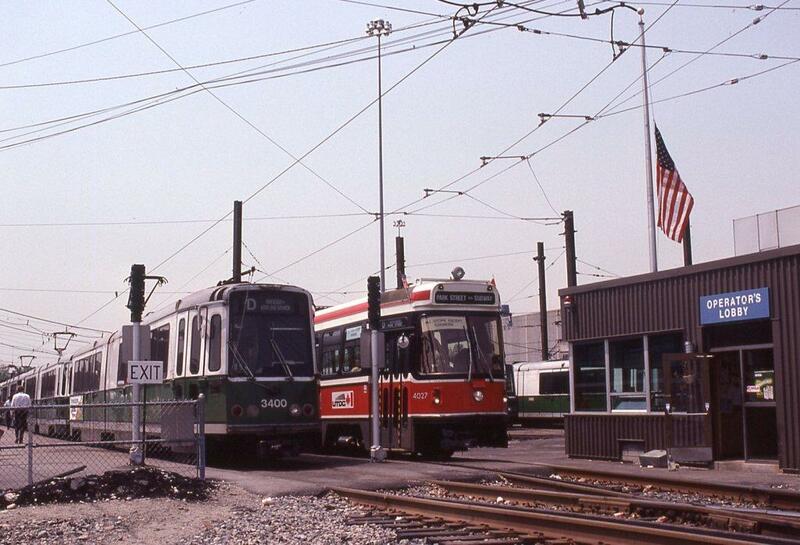 With all the recent talk about Ontario Place, and with Exhibition season almost upon us, I thought this would be a good excuse for photos of streetcar services to the Ex. Decades ago, the CNE raised much bigger crowds and there was a time it really was a showcase, an “exhibition”. I remember when the “Better Living Centre” was brand new, and its intent was to give fairgoers a look at all that was new and exciting in household goods. The Internet didn’t exist yet, and the phenomenon of the shopping mall full of goods manufactured anywhere but here was in its infancy.